This confit byaldi recipe makes such a beautiful and elegant presentation, the lightly caramelized, savory flavors are almost a second thought. 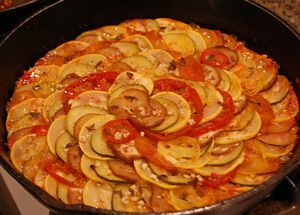 Thomas Keller of the French Laundry made this interpretation of classic ratatouille popular, and now there are countless variations in the culinary world, each more delicious than the last. Preheat the oven to 300. Lightly grease a large round or oval baking dish. Spread the piperade along the bottom of the dish. Alternating ingredients, arrange the zucchini, yellow squash, and tomatoes in a spiral pattern around the dish. Sprinkle the squash and tomatoes with the chopped garlic and thyme. Cover the confit byaldi with a single layer of parchment paper cut to fit the inside of the dish and rest atop the ingredients. Bake the ratatouille for 1 hour and 45 minutes. Remove the parchment paper and continue baking for an additional 25 minutes, until the top is lightly browned. Drizzle the surface of the confit byaldi with balsamic vinaigrette and season it with salt and pepper. Serve the dish fresh from the oven or allow the flavors to develop and mellow in the refrigerator for a day.